Welcome back again to my 12 Days of Christmas Series. Half way through my series already! As I mentioned yesterday we had our team Christmas party and we do a secret santa gift. I made this gorgeous little Christmas decoration and put some little goodies into the bauble. Again I used the gorgeous fun paper Santa’s Workshop Specialty Designer Series Paper. I used the Garden Green & White bakers twine this time that is also in the suite of products. The original design of the bauble is from Pootles. If you’d like to order any of these products, just click on any of the items below to be taken to my online shop. All these products are on the retiring list so you need to get in quick before they’re gone for good. And finally, if you’d like a weekend away being creative then come along to my Stamp Camp which is in April, 2019. The cost is $285 which includes all meals and accommodation for 2 nights. You can get more details by clicking on the QR code at the top right of this page. 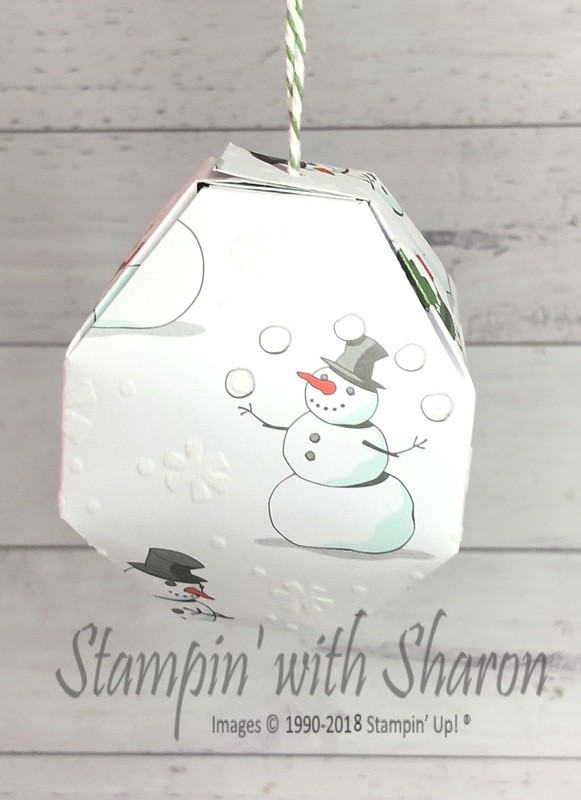 This entry was posted in 12 Days of Christmas, 2018-2019 Annual Catalogue, Holiday Catalogue by sharon. Bookmark the permalink.